Loteprednol etabonate is indicated for the treatment of steroid responsive inflammatory conditions of the palpebral and bulbar conjunctiva, cornea and anterior segment of the globe such as allergic conjunctivitis, acne rosacea, superficial punctate keratitis, herpes zoster keratitis, iritis, cyclitis, selected infective conjunctivitides, when the inherent hazard of steroid use is accepted to obtain an advisable diminution in edema and inflammation Loteprednol etabonate is less effective than prednisolone acetate 1% in two 28 day controlled clinical studies in acute anterior uveitis, where 72% of patients treated with Loteprednol etabonate experienced resolution of anterior chamber cells, compared to 87% of patients treated with prednisolone acetate 1%. The incidence of patients with clinically significant increases in IOP (210 mmHg) was 1% with Loteprednol etabonate and 6% with prednisolone acetate 1%.Loteprednol etabonate should not be used in patients who require a more potent corticosteroid for this indication. 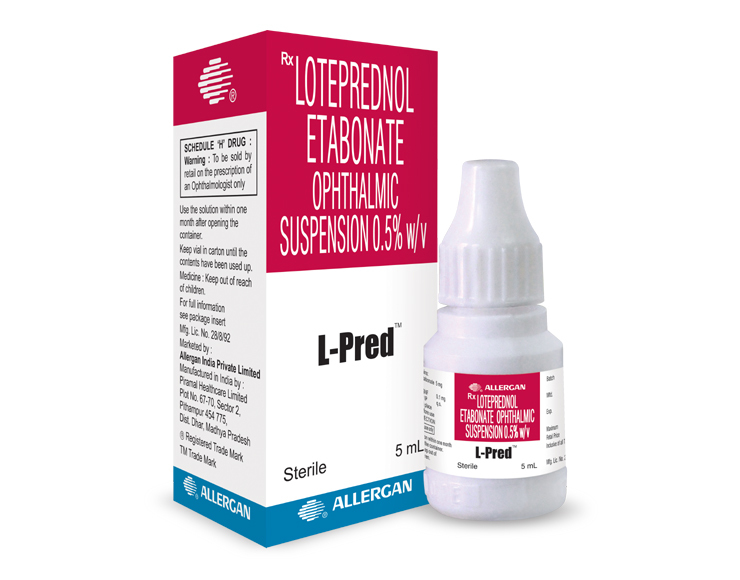 Loteprednol etabonate is also indicated for the treatment of post operative inflammation following ocular surgery. L-Pred™ available as a sterile suspension in 5 mL plastic dropper bottle.